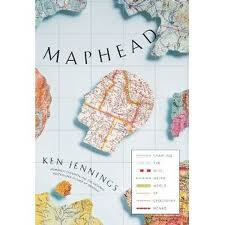 I recently finished Maphead by Ken Jennings (best known for his exploits on the TV game show Jeopardy!) and enjoyed the book quite a bit. 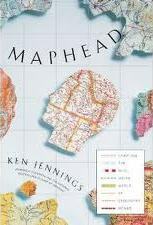 There's a lot of interesting material and it all seemed to work well together with each chapter being about yeah, something map-related, but more importantly, something of interest to Jennings. Result of this was a book on content the author into and which was well written in a funny and conversational style. Chapters 2 (Bearing) and 4 (Benchmarks) – Both contained interesting writing about the idea of maps as a key to place in the world today and throughout history. Part of this was look at the Geography and Map Division of the Library of Congress. Chapter 5 (Elevation) – Was about collectors of maps and included a quote from one who spoke of maps combining "art, history, scarcity, antiquity and intrinsic interest." Additional mention was made in this chapter of different areas of map collecting with another collector quote being "if you're going to specialize, specialize as much as possible." Chapter 6 (Legend) – Written about the type of people drawn to maps, including Austin Tappan Wright and his incredible made up civilization of Islandia, published posthumously as a thousand page book. Sections of writing by Jennings are also devoted to his idea that "all maps are fantasy maps, in a way.” Related to this, there’s novel series like Harry Potter or Lord of the Rings that feature created in the imagination immersion worlds of great detail (i.e. just like maps provide). It’s an interesting idea around made up civilizations and brings to mind that not all fiction has to be about star crossed lovers. There can be incredibly creative fictional writing that would be non-fiction if, you know… actually real. Chapter 8 (Meander) – About people who obsessively visit places and mark them off… includes mention of High Pointers (who visit the highest geographic feature in each state), Travelers Century Club members (who have been to 100+ countries), and people who just want to experience things. To this last category of person, Jennings mentions Chris Guillebeau, a now 34 year old guy who travels to new places on the cheap because it's interesting to him and has written extensively (with a forthcoming book) on the topic. Struck me as reminiscent of the story of Caballo Blanco with someone knowing what they wanted to do and then doing exactly that, rather than viewing their ultimate goal or lifestyle as being something for later. Chapter 9 (Transit) – Features people fascinated with roads… which brought to mind for me the excellent Tom Vanderbilt book Traffic. Chapter 10 (Overedge) – Written about geocaching, a pastime not even possible until 2001, when the government eliminated the GPS mandate of Selective Availability, effectively switching GPS accuracy from a few hundred feet down to a few feet. Jennings wrote interesting material on geocachers… quite a few obsessive people, but also quite a few people (more than ever with GPS on cell phones) getting out and exploring the world. Chapter 11 (Frontier) – Covers Google Maps and Google Earth and gets into the fascinating concept of mashups (combining Google Maps with data sets like crime statistics) and the one step further idea of augmented reality via things like Google Goggles. Chapter 12 (Relief) – This conclusion chapter takes things back to the concept mentioned in relation to collectors… maps combine history, geography, art, a place in the world and people, and especially kids, love maps. Overall, really entertaining book that comes across as something the author probably enjoyed writing.